Last night I 'demonstrated' at a local preschool fundraiser. OMG what a dangerous place to be. A centre full of stalls with catalogues. It was paradise!! Anyway, I digress! In addition to SU catalogues and samples of cards, boxes and projects, I had a box of handmade cards and gift cards for sale. These were quite popular and gave me an opportunity to use the very little but cute, One of a Kind stamp (officially known as Kind Heart!). This stamp conforms to the Angel policy of SU and permits the use of Stampin' Up! images on products for sale. If you need to know more information on the angel policy, please contact me! Now I can show off some of the gift cards I had made. They are so cute and easy too! I'll try and remember what I used! 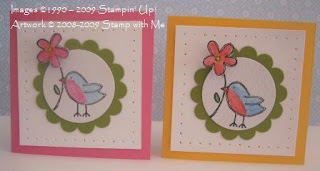 The birdie gift card set uses the Fun Fast Notes stamp set, Pixie Pink or Yoyo Yellow CS as the base, Whisper White CS, Old Olive CS & Watercolour paper. The image is coloured in with watercolour pencils and the image stamped with StazOn. This little bird idea was cased from somewhere, unfortunately I no longer remember where. If you know, please contact me with details, so I can give credit where credit is due! 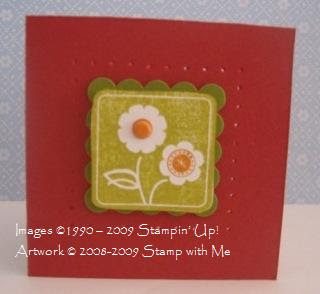 This little card uses the new Fun Flowers stamp set from the Spring Mini. I've loaded the stamp with Kiwi Kiss from the ink pad, and then used my Stampin' Write marker in Pumpkin Pie to add the details in the centre of each flower. I have cut them out, used the corner rounder punch on each corner. Before adhering it to the Old Olive CS, cut with the Scallop Square punch, I have added a brad to the centre of one of the flowers. The flower image is adhered to the square with Stampin' Dimensionals. This has then been layered on the gift card in Ruby Red CS. As you can see, I have also used piercing in this gift card as well as for the birdies! These little cards were from an idea I saw at the Canberra Craft & Quilt Fair. The giftcards are So Saffron CS, layered with Whisper White and then Bashful Blue. One of the cards has the flower (from the Priceless set) stamped with Brocade Blue on Whisper White and then punched out and layered on So Saffron. 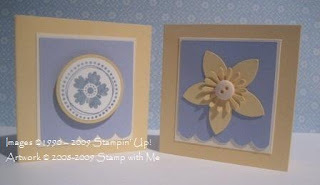 The second card uses punches, including the Scallop Edge punch and the flower punches to make the flower. The button adds interest too! I wish I had taken a photo of my table last night, but didn't :( All of these gift cards were packaged in cellophane bags, tied off with ribbon and had their own little matching tag (very cute!). I had them hanging on my little silver 'tree' with my pink flower fairies hanging in-between! Next time I'll take my camera.